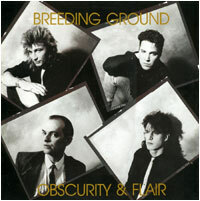 Formed in Toronto in 1980, Breeding Ground’s original line-up included John Shirreff (vocals), Hugh Gladish (and later Chris Wardman – guitar), Jonathan Strayer (bass), and Ken Jones (drums). Similar to last week’s featured band It’s Immaterial, Breeding Ground released several singles, two EPs and one LP throughout the entire 80’s decade. Breeding Ground garnered airplay on college campuses, which gave them a large, loyal, yet limited following. 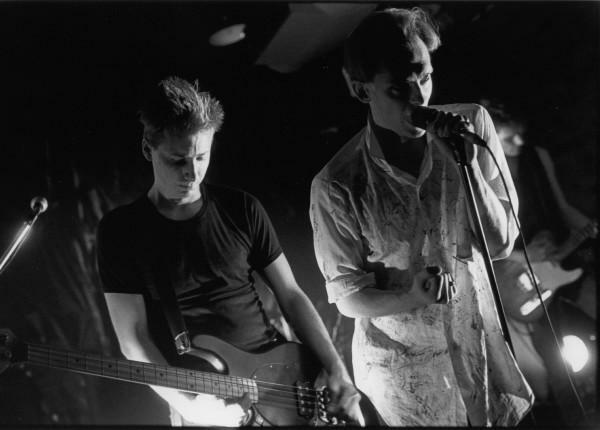 In the mid-80’s, two of the original band members, Strayer and Jones, were replaced by Gary Quinn (bass) and Kevin Hunter (drums). In 1986, the band made a strong attempt to hold onto their popularity with the release of their second EP. Their one and only full-length album, ironically titled Obscurity and Flair, and featuring Alta Moda singer Molly Johnson along with Chalk Circle’s Tad Winklar on saxophone, did not make its debut until 1989. By that time, unfortunately, Breeding Ground was essentially defunct. 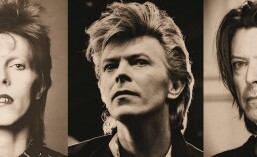 The band’s music is kept alive today by DJs of exceptionally good taste. Both David Marsden and Ed-FM play Breeding Ground selections on their shows, which is how I became familiar with them. It’s a shame their popularity did not exceed the boundaries of college campuses, because Breeding Ground was one of those criminally obscure bands that should have enjoyed more far-reaching success. Unfortunately, I am not able to find Breeding Ground music for sale. If someone knows of a source, please leave a comment. This entry was posted in 80's Music, Post-Punk, New Wave, Canadian, Criminally Underrated, Obscure 80's Music and tagged 80's Music, Breeding Ground, Canada, Canadian New Wave, Chris Wardman, Gary Quinn, Hugh Gladish, John Shirreff, Jonathan Strayer, Ken Jones, Kevin Hunter, New Wave, Obscure New Wave, Post-Punk, Underrated Artists. Bookmark the permalink. eBay has the odd album or CD up for sale. Other than that, I’m sure you’d find an occasional momento in the used music shops. We didn’t sell lots so they may be few and far between. Oh and by the way, Chris Wardman was NOT an original member of the band. He joined for a short time at the initial start-up of phase 2 in 1987 and did not last very long due to a personality mismatch you might say. Yes Miss Parker (who are you anyway?) – I have connected with David Marsden on FB as Brad from Chalk Circle informed me a year ago that he was playing our stuff occasionally on his radio show in Oshawa (?). Dave has always been that great dj promoting left of centre stream music. I am not familiar with Ed-FM and CFRC but probably should be no ? I will do a search on the internet for him and the station. I miss those days in the 80’s living in Toronto and being a small part of the club racket. Fond memories. If you’d like to connect with me on FB, please send a request to Sandy Numanfan Missparker.